A 16 year old boy is brought into the ED by his friends after drinking some “tea” that one of his other friends had brought over. Shortly after drinking the tea, the boy became agitated and confused, speaking incoherently, and picking at his sweater repeatedly. He has no known past medical or psychiatric history. He takes no medications and his friends deny any other ingestions, alcohol use, or drug use. On exam, the patient appears agitated and disoriented, has dry and flushed skin, dilated pupils bilaterally, and dry mucous membranes. The friend brings a picture of the plant they used to make the tea (see below). What toxidromes can be included in the differential diagnosis? Delusions, paranoia, tachycardia, hyperpyrexia, diaphoresis, mydriasis, hyperreflexia, hypertension, and seizures. *Note: The skin may be dry if patient is dehydrated. Diaphoresis, tachycardia, tachypnea, hyperthermia, altered sensorium, visual and tactile hallucinations, and seizures. Datura Stramonium, commonly known as Jimsonweed, contains the Belladonna alkaloids atropine and scopolamine. Both are anticholinergic drugs, acting primarily to block muscarinic receptors located in the CNS, heart, and smooth muscle tissues. What other findings can this toxidrome present? What other drugs produce this toxidrome? What is the treatment for this type of toxicity? –Benzodiazepines (BZDs) and active cooling for hyperthermia and agitation. Consider physostigmine in cases of severe agitation, but avoid if there are cardiac conduction abnormalities or suspected TCA overdose, as this may cause cardiac arrest. -Treat seizures with BZDs. Phenytoin is preferred for seizures with a clear anatomic focus, but has little efficacy in anticholinergic-induced seizures. -Consider sodium bicarbonate if a wide complex tachycardia (QRS > 100 msec) is present. Campbell N, Boustani M, Limbil T, et al. The cognitive impact of anticholinergics: a clinical review. Clin Interv Aging. 2009;4:225-33. Krenzelok EP. 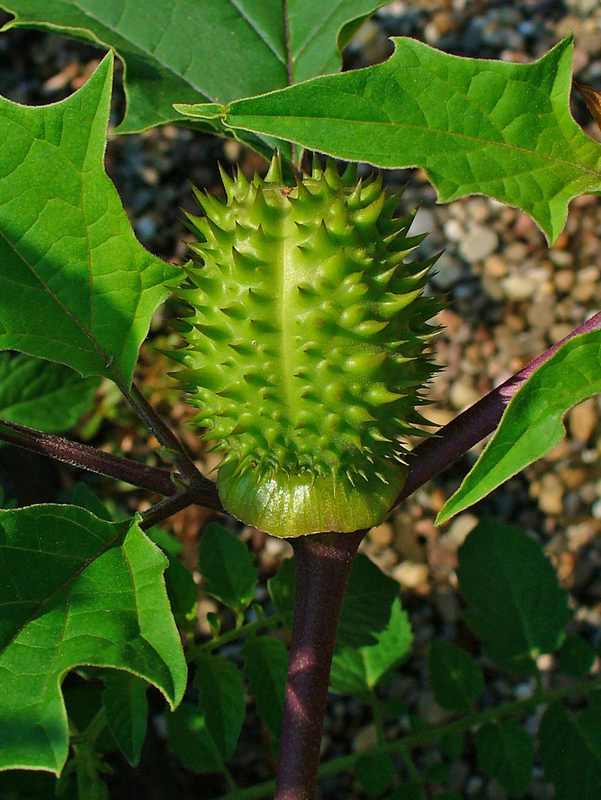 Aspects of Datura poisoning and treatment. Clin Toxicol (Phila). 2010 Feb;48(2):104-10. Meehan TJ, Bryant SM, Aks SE. Drugs of abuse: the highs and lows of altered mental states in the emergency department. Emerg Med Clin North Am. 2010 Aug;28(3):663-82.